After leaving Paris, your private driver will give you a quick historical introduction to the battles of WW1. This war took place in several parts of Europe and cost the lives of more than 22 millions people. After the first year of war, the opposing armies changed from a mobile war into static one, the infamous trenches war. The major effort of the British Empire Forces was in France and Belgium. On the other hand the most memorable war event for the U.S. army was in the Marne Valley who fought the German around the town of Chateau-Thierry. During this journey , an important number of memorials, museums, cemeteries and historic sites can be found in these ancient battlefields and difficult task is trying to visit all of them, especially in one day. Only for the department of Calais, there are 575 WWI cemeteries. Everyone knows about the decisive intervention of the Allies forces during World War II. Very few though know their action during WWI. With MyDriverParis , we offer you to discover this forgotten memorial tour. During this private tour from Paris ,it is possible to focus on sites where Canadians, Australians, Americans, New Zealanders, South-Africans had fought. 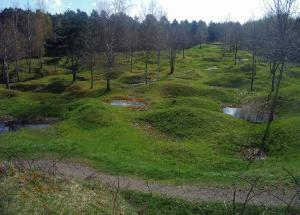 Many battlefields are undoubtedly dearer to some nationalities than others so you can choose the sites where to go.